In the winter, you can typically find me in over-the-knee boots, some shade of skinny jeans and a sweater. It's so easy to slip into a routine of wearing the same thing all the time. Sometimes I'll get onto myself for not being creative with my outfits, but when it's so cold outside, all you care about it warmth and comfort! Sweater. Sunglasses. Earrings. Jeans. Boots. 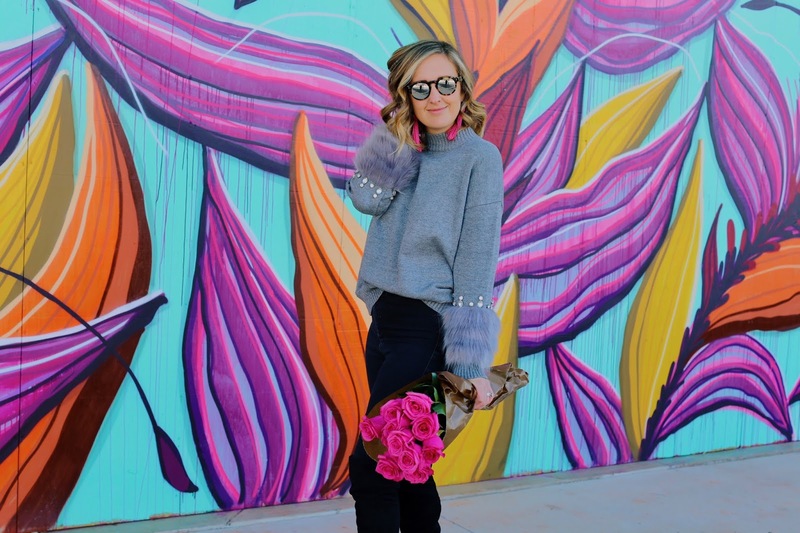 I think the easiest way to jazz up your winter wardrobe without spending a fortune is to pull in a few fun (and inexpensive) sweaters. I loved the faux fur sleeves and jeweled detailing on this one, and with a price tag of under $30, it had my name all over it. The best part is that I found a matching one for Parker here a week later!